Between Blue and Yellow: Kitchen Update-Glass Cabinets! So far this has been my 2nd kitchen update. It has taken about a month to get to this point, and we still have a long way to go. We have decided to get dark bamboo floors installed eventually. But I'm SO happy to announce that we hung the final glass cabinet last night around 9:30pm. And I could not be more thrilled with the result. I've had this vision for my kitchen since the day we moved in almost 5 years ago, and it's finally starting to look just like I pictured in my head. 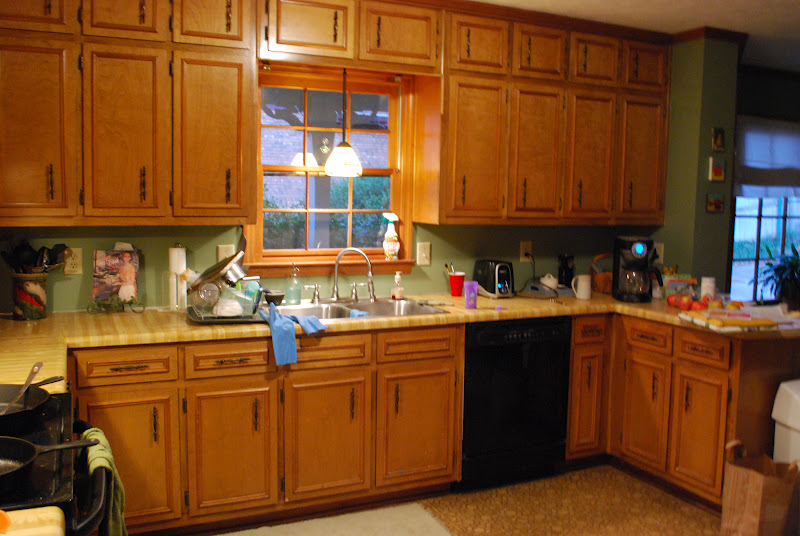 The first project we completed was painting the counter tops with Giani Granite Paint. The second was the new faucet . And now I can add glass cabinets to the list! For those who have forgotten what we started with. 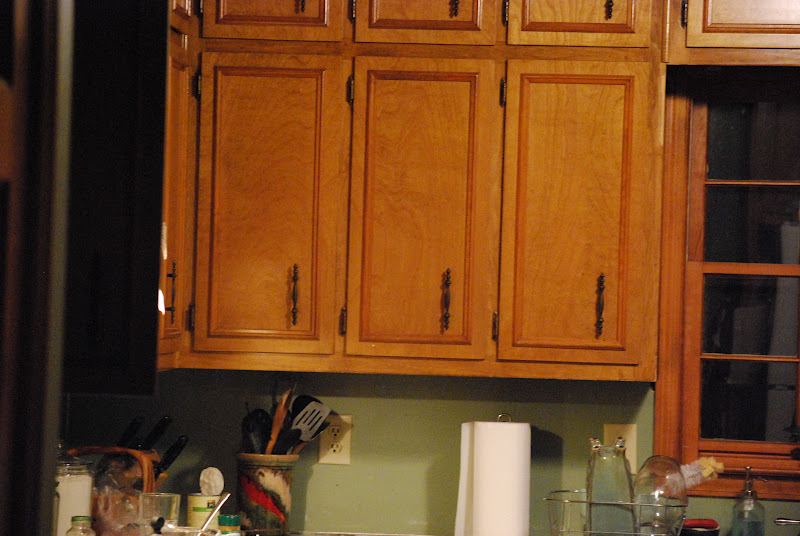 Honey colored cabinets, fake butcher block counters. and still existing linoleum flooring. Here is a side by side comparison of the same spaces before and after. We decided not to put pulls on the top, just because I think it looks better with out so many knobs and such. Plus with 50 cabinets, it was starting to get pretty expen$ive. And a couple more just for fun. Although I love the green color, it just doesn't seem to go. So I will be painting it. Click here for my kitchen paint colors. We accidentally cut one of the wrong cabinets, whoops! So I will be able to share the other side of the kitchen once we fix that. your kitchen looks amazing and it jus took paint and hard work! 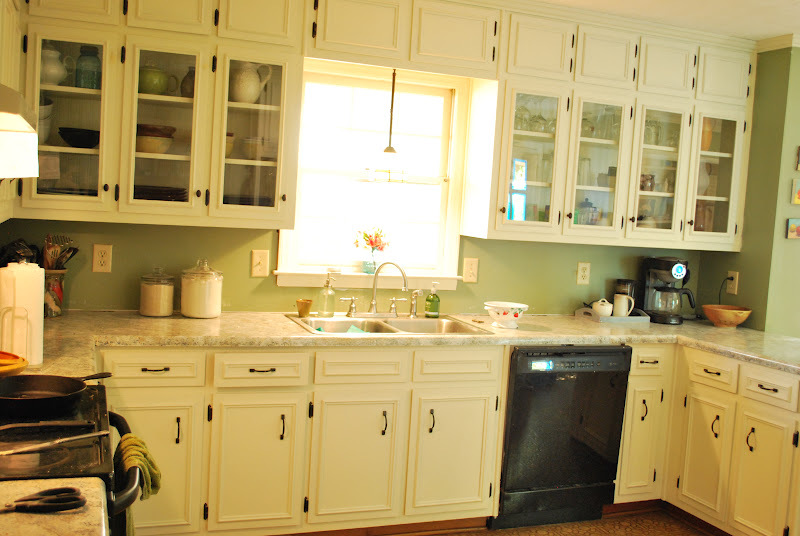 between the countertops and cabinets it is stunning! it doesn't even look like the same kitchen! it looks amazing! i was just thinking how pretty the green walls looked... save yourself the trouble! it looks so great. That looks great!! Love the glass cabinets. It looks so bright and airy. :) I want to do mine now. oh my gosh that looks FREAKING AMAZING!!!!!!!!!! You rock girl! I absolutely love those cabinets! The color is perfect. Great job. I don't know if you are doing a backsplash but I could totally see subway tile fitting in perfectly. Wonderful job, what a great transformation. I can't believe my eyes! It's a wonderful transformation. The glass cabinet doors look like they were custom made that way. And the colors you've chosen really update the room. Visiting from FFF. They are absolutely gorgeous! You have taken my breath away. Your kitchen is coming together beautifully. 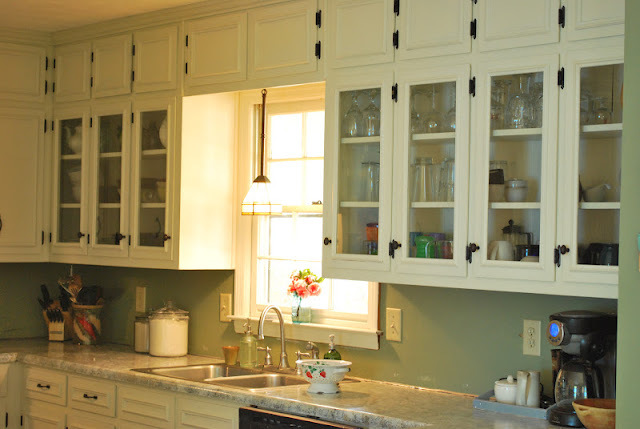 I love the glass panels in the wall cabinets. They look fabulous! I was hoping we could do this in our house, but when you only have 14 cabinets total, they end up being quite full, and not very display worthy. You did a wonderful job! I love your kitchen!! 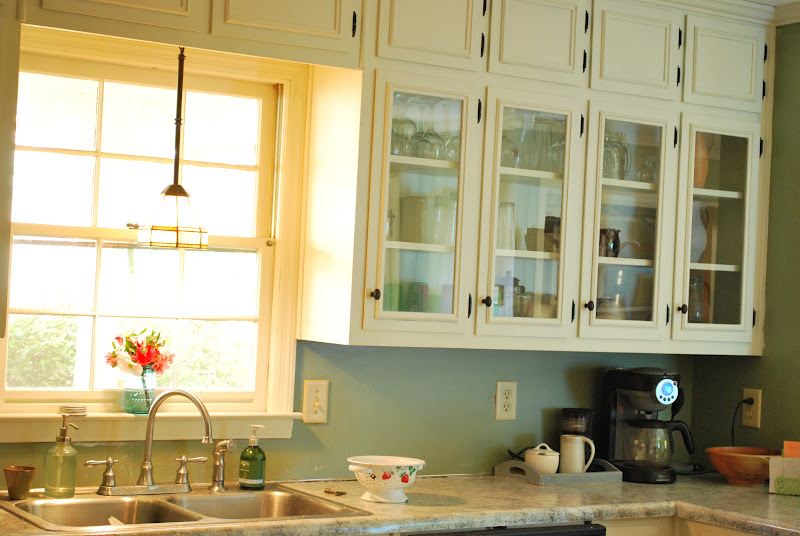 The glass cabinets look so nice and really change the whole look of your kitchen. I love your countertops too - are they granite? You did a great job! Wow, what an amazing transformation! The colours you chose are gorgeous. Wow!!! Your kitchen looks amazing! great job - the glass cabinets add so much. I hope to make it to the barn sale. Your sweet mother-in-law keeps posting reminders!! Awesome! 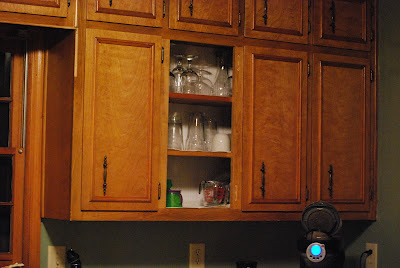 What a difference...I cannot wait to hear how you did it...I need to do this to my cabinets!! Now following you so I make sure to get the update! That's an incredible before and after. It looks like an original farmhouse kitchen. Amazing work! Now I'm getting the full effect of the whole kitchen - it seriously looks amazing! OMG!!! That looks amazing! 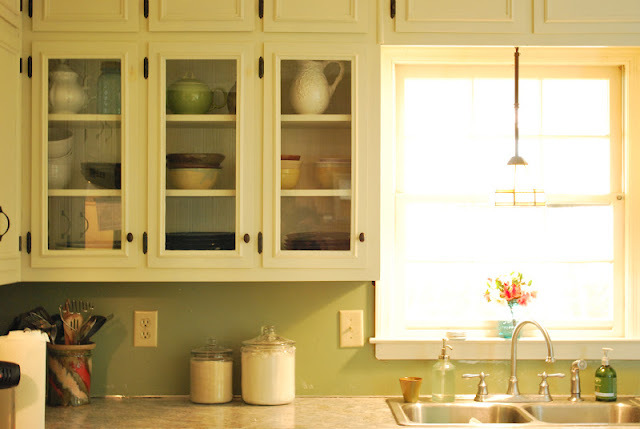 I so wish I could paint our cabinets so they could look like that. Definitely going in the 'inspiration' pin board. Great work! After our conversation at dinner tonight, I had to stop in and check out the kitchen. AMAZING!!! So glad to meet you! I love your cabinets! Isn't it funny what a coat of white paint will do? Now they look like a million bucks! Oh, wow! What a beautiful transformation! I actually like the green but looking forward to seeing the new color too. Everything looks awesome! Great job! 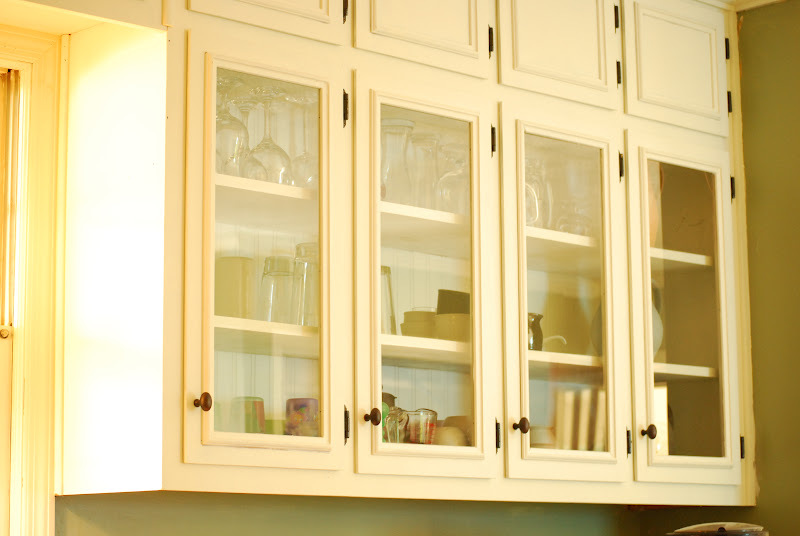 Your cabinets look amazing! I'm so very much want to do this in my home ... gonna check out that tutorial! 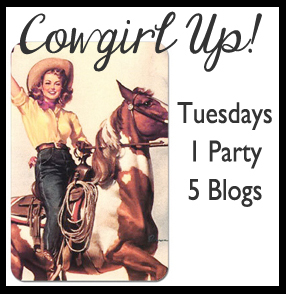 Oh, and I pinned it too! Your kitchen is so pretty. I love your glass cabinets. Wow! It is hard to believe those are even the same cabinets! AMAZING! WOW! That's an amazing kitchen update. I can't believe what a difference the glass cabinets made. Just fantastic! Looks awesome. I hope it shows people they shouldn't be afraid to paint over wood cabinets. It's an amazing improvement! Did you put the glass in the cabinets yourself? That is one of my dreams for my kitchen, but I don't want to replace each door. I have no idea if it is possible to cut out and and glass. What a difference! I'm also curious if you did the glass yourselves. It came out fantastic!